If you’ve read Scott Weidensaul’s excellent book The Ghost With Trembling Wings (2002), you’ll recall the story of Louise Emmons and the giant Peruvian rodent she discovered. But before I get to that, let me say that The Ghost With Trembling Wings isn’t about ghosts at all, but about the search for cryptic or supposedly extinct species. Think thylacines, British big cats, Ivory-billed woodpeckers, Cone-billed tanagers, the resurrection of the aurochs, Night parrots, Richard Meinertzhagen and the Indian forest owlet. It begins with Weidensaul’s search for Semper’s warbler Leucopeza semperi, an enigmatic parulid endemic to St. Lucia, discovered in 1870 and last seen alive in 1969 (although with a trickle of post-1969 sightings, some reliable and some not so reliable). If you’re interested in the hunt for cryptic species and zoological field work and its history, it is mandatory that you obtain and read this inexpensive book. Louise Emmons is a highly distinguished, experienced mammalogist who has worked on bats, tree shrews, cats big and small, and rodents, and is also the foremost expert on the mammals of the Neotropical rainforests (she wrote the only field guide to Neotropical rainforest mammals: Emmons 1999a). On 15th June 1997, while on an expedition to the northern Vilcabamba range of Cusco, Peru, she was walking along a forest track when, lying dead on the track in front of her, she discovered a big dead rodent. Pale grey, but handsomely patterned with a white nose and lips, and with a white blaze running along the top of its head, it was over 30 cm in head and body length, and with a tail over 20 cm long. Its broad feet, prominent and curved claws, large hallux, and palms and soles covered in small tubercles indicated that it was a tree-climbing species. A large bite wound on the neck indicated that it had recently been killed by a predator, probably a Long-tailed weasel Mustela frenata. And it was entirely new: no one had ever recorded anything like it before. In her description of the new species, Emmons (1999b) named it Cuscomys ashaninka (meaning ‘mouse from Cusco, of the Ashaninka people’) and showed that it was a member of Abrocomidae. This is an entirely South American group previously known only from Abrocoma Waterhouse 1837, members of which are sometimes called rat chinchillas, chinchilla rats or chinchilliones, and from the Miocene fossil Protabrocoma Kraglievich 1927. Abrocoma is known from eight species (A. bennetti, A. boliviensis, A. cinerea, A. vaccarum, A. uspallata, A. budini, A. famatina and A. schistacea), among which A. boliviensis was only recognised in 1990 and A. uspallata in 2002 (Glanz & Anderson 1990, Braun & Mares 1996, 2002). Incidentally A. bennetti has 17 pairs of ribs – more than any other rodent. Abrocoma produces midden piles, and Pleistocene rodent middens from Chile have been identified by DNA analysis as having been produced by Abrocoma (Kuch et al. 2002). Abrocomids are members of Hystricognathi, the rodent clade that includes Old World porcupines and the New World caviomorphs (New World porcupines, agoutis, pacas, cavies, pacaranas, capybaras, hutias, chinchillas, vizcachas and so on), and within this group they appear to be members of a clade that includes chinchillas and vizcachas. So now there is a second extant abrocomid taxon, and it and Abrocoma are actually quite different. Species of the latter are specialized for life at high latitudes, and have short tails, a reduced hallux and inflated auditory bullae. They’re entirely terrestrial, inhabiting burrows among rocks, and are therefore like chinchillas, and convergent on degus and pikas. 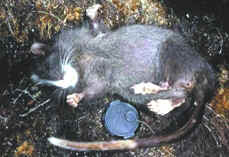 While Cuscomys shares derived characters with Abrocoma not present in other rodents, it’s larger, long-tailed and with features indicating a scansorial lifestyle. It’s convergent with climbing murids, like the cloudrunners Crateromys and cloud rats Phloeomys of the Philippines and the giant tree rats Mallomys of New Guinea (Emmons 1999b), and its striking coloration is much like that of the White-faced tree rat Echimys chrysurus (a member of the echimyid, or spiny rat, family: echimyids are hysticognaths, as are abrocomids, but they apparently belong to the octodontid-hutia clade, not to the chinchilla-vizcacha clade (Sánchez-Villagra et al. 2003)). Here’s where this story becomes even cooler. During his 1912 Yale University-National Geographic expedition to the Inca ruins of Machu Picchu, Peru, George Eaton discovered that a number of different mammal species had been placed, in graves, alongside human bodies (Eaton 1916). They included familiar animals like dogs, llamas and guinea pigs, but also others that are far more obscure. Dwarf brockets were there (brockets Mazama are a group of small-bodied deer known from Mexico and South America), as were coro-coros (also called bamboo rats Dactylomys, coro-coros are arboreal members of Echimyidae), Mountain pacas Cuniculus taczonowskii*, AND an abrocomid that Eaton recognized as a new species. He named it Abrocoma oblativus. *Eaton (1916) misidentified the Mountain pacas and thought that the Machu Picchu remains represented a new species that he called Agouti thomasi. Incidentally, the genus Cuniculus Brisson 1762 is the same animal as that more often called Agouti Lacépède 1799. The former name clearly has priority though. Emmons’ discovery of Cuscomys ashaninka allowed her to determine that the abrocomid in the Machu Picchu graves wasn’t a species of Abrocoma as Eaton had thought, but a second member of Cuscomys, so it became renamed C. oblativus. Given what we now know of the life appearance of Cuscomys, it’s likely that C. oblativus was similar: strikingly patterned, and overall quite cute and cuddly. There’s the obvious implication here that Inca people were being buried with sacrified specimens of Cuscomys because they kept them as cuddly pets, though of course it’s also possible that the animals were kept as food. If C. ashaninka has been cryptic enough to remain undiscovered until 1997, can we be absolutely sure that C. oblativus is really extinct? No. While the graves containing C. oblativus have been dated to 1450-1532 AD (Emmons 1999b), even today the region surrounding Macha Picchu is sparsely inhabited, remote, and with a substantial cover of pristine cloud forest. There just isn’t any good reason why C. oblativus should have become extinct, so Emmons (1999b) suggested that it might still be extant, and awaiting rediscovery. Here’s another interesting thing. Of those mammals found in the Inca tombs, Cuscomys was unknown to modern scientists, in its living state, until 1997. The dwarf brocket present there turned out to belong to a new species that wasn’t named until 1959 (when Hershkovitz named it Mazama chunyi*), and the coro-coros and mountain pacas present in the tombs have also proved to be cryptic and elusive. So the Incas knew mammals that remained unknown to modern science until the late 20th century, and in fact knew them well enough to capture them frequently, and perhaps keep them in semi-domesticated state. As Emmons noted ‘Macha Picchu hunters were evidently skilled at capturing cloud forest mammals that are not readily taken by our current collecting methods’ (1999b, p. 13). I know nothing of how Inca hunters tracked and caught the animals they did (nor do I have access to literature that might be informative on this subject), but it would be very interesting to know just how they were finding and catching these species. They must have had the most excellent, experienced field skills, and the most intimate knowledge of the species they were hunting. *Mazama chunyi isn’t the only recently-recognised brocket species. M. permira, a dwarf island-endemic from Isla San José off Panama, wasn’t named until 1946, and M. bororo was named in 1996 after a specimen kept at Sao Paulo’s Sorocaba Zoo demonstrated the distinctiveness of this taxon (Duarte & Gianonni 1996). What might be a new species was recently reported by Trolle & Emmons (2004) for a specimen photographed by a camera trap in 2003. The photo of the Cuscomys ashaninka holotype used above is from here. Braun, J. K. & Mares, M. A. 1996. Unusual morphological and behavioural traits in Abrocoma (Rodentia: Abrocomidae) from Argentina. Journal of Mammalogy 77, 891-897. - . & Mares, M. A. 2002. Systematics of the Abrocoma cinerea species complex (Rodentia: Abrocomidae), with a description of a new species of Abrocoma. Journal of Mammalogy 83, 1-19. Eaton, G. F. 1916. The collection of osteological material from Machu Picchu. Memoirs of the Connecticut Academy of Arts and Sciences 5, 1-96. Emmons, L. H. 1999a. Neotropical Rainforest Mammals: A Field Guide (Second Edition). University of Chicago Press (Chicago & London). - . 1999b. A new genus and species of abrocomid rodent from Peru (Rodentia: Abrocomidae). American Museum Novitates 3279, 1-14. Glanz, W. E. & Anderson, S. 1990. Notes on Bolivian mammals. 7. A new species of Abrocoma (Rodentia) and relationships of the Abrocomidae. American Museum Novitates 2991, 1-32. Kuch, M., Rohland, N., Betancourt, J. L., Latorre, C., Steppan, S. & Poinar, H. N. 2002. Molecular analysis of a 11,700 year-old rodent midden from the Atacama Desert, Chile. Molecular Ecology 11, 913-924. Sánchez-Villagra, M. R., Aguilera, O. & Horovitz, I. 2003. The anatomy of the world’s largest extinct rodent. Science 301, 1708-1710. Weidensaul, S. 2002. The Ghost With Trembling Wings. North Point Press (New York). The photo you show is available on the BBC news repport from that time. I enjoy the colorful way she uses to describe the find. Have You considered that the Inca hunters' better success might be due to habitat changes? There is good evidence that there was a great deal more open country in many parts of the Americas before the collapse of native populations during the 16th centuries. Perhaps C. oblativus isn't even a species that thrives in dense montane rainforest? Well...Cuscomys oblativus has been seen alive just a few days ago near Machu Picchu. There is a picture of this species taken with a cell phone camera. Experts think that this species is still living there. Here is the report in Spanish.